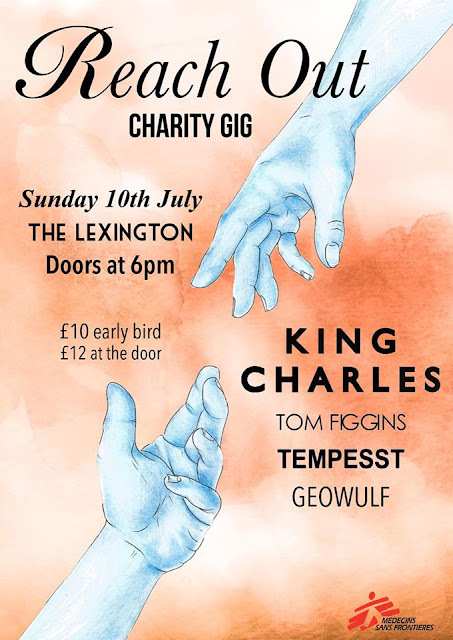 I posted a few days ago about the upcoming Reach Out Charity gig, raising money for MSF (Doctor Without Borders), taking place at London's The Lexington next month with the brilliant King Charles, Tom Figgins, Tempesst and Geowulf. I can't wait for the show and highly recommend grabbing a ticket and joining me. It's an absolute bargain at £10, the line up is superb and it's for a great cause - what's not to like? I caught up (by the wonders of the internet) with one of the show's organisers, Mercedes, to ask her a few questions about the night. What does the charity mean to you? Medecins Sans Frontiers/Doctors Without Borders is one of the most significant charities around today as it combats worldwide issues whilst staying politically neutral, thereby not taking any sides and simply supplying aid. We found MSF a particularly striking charity for the crisis in Syria, as it works on providing help for all. It does this through the establishment of hospitals in land as well as in the neighbouring countries, MSF also provides search and rescue on the Mediterranean Sea, and has work in refugee camps (for example, the Calais ‘Jungle’). We believe that it is the key charity that will provide the most aid to the affected people and areas. Have you been involved in fundraisers for the charity before? Neither of us have raised for this particular charity before, however we have both been involved in fundraisers, including for other charities such as Childreach International. Have either of you put on a gig before or is it new territory? Mercedes put on a tiny gig at university a few years ago. We believe The Lexington is a great venue and is in a fantastic location in London as it is incredibly central, directly in between King’s Cross and Angel. And to get you in the mood.... here's a recent session video of King Charles, playing his track Choke.